After visiting Lisbon and Sintra in 2016, I knew I wanted to revisit Portugal and explore it some more. It has beautiful tiled building and medieval castles, cobblestone streets, delicious seafood, and good wine. It’s relatively cheap compared to most Western European countries, and the people are warm and friendly to tourists visiting. We started off our time in Porto with a walk across the Dom Luis I bridge that overlooks the Douro River. Originally Gustave Eiffel presented a project to construct this bridge, but the city was quickly growing so they felt they needed a double deck platform. Even though Eiffel didn’t design the final bridge, it still bears a great resemblance to the construction of the Eiffel Tower. Walking across this bridge you can see the views of the hilly, colorful tiled views of this beautiful city and the river than runs through it. It’s a nice way to start to exploring Porto. There’s a lot of Art Nouveau art and architecture throughout Porto, but most popular is the Majestic Cafe. This place is special because it’s preserved it’s 1920’s vibe. It’s as if you’ve stepped back in time. We ordered a franceschina, which is two slices of bread with steak, ham, sausage and chorizo inside, covered in melted cheese and drizzled in a secret, spicy, tomato based sauce. It’s a traditional Portuguese dish, and it’s tasty, but rich! I recommend splitting one unless your ravenous. This restaurant is definitely a tourist trap with overpriced, underwhelming dishes. However, I’m a sucker for preserved historical ambiance so I think it’s worth stopping in for a bite, even if it’s just a cafe and desert. They also do tea time, which looking back on it would be the ideal scenario for visiting. Clérigos Church is a Baroque church in the city of Porto. For just 5 euro, you can get a workout climbing the stairs to the museum where you can look down at the church from the upper height of the alter. There is also a museum above with an art collection that’s rich in religious history, but pretty progressive when you read all about the collections of art. Finally, we climbed the narrow spiral stairs further up the Torre dos Clérigos, a baroque bell tower that boasts a 360 degree view of the whole city. From the Clérigos Tower we spotted an outdoor bar, and decided to go have drink after a half day of exploring. Base is a park-like bar unusually situated above shops in the middle of Porto. It’s large space of grass, olive trees, and big plush bean bags. We sat in the comfy chairs sipping wine and paying fetch with some of the dogs that were roaming around. I loved this little tranquil haven in the middle of city shops and streets. Dubbed “the coolest bookshop in the world,” Livraria Lello is a unique architectural wonder. It’s another stunning example of Art Nouveau architecture, with curves and intricacies throughout, like the grand red carpet staircase as a centerpiece. J.K. Rowling was a frequent visitor here when she lived in Porto, which has made it’s popularity even greater. When you step inside you’ll see why. It literally feels like you’ve stopped into a Harry Potter movie. We visited Rota Do Chá Tea House, a magical little sanctuary with a lengthy tea list. You wouldn’t see this place from the street, it’s hidden away with multiple colorful quaint rooms and a spacious back patio. It’s a great place to wind down and grab a small bite and some tea, and the prices are really reasonable. Europeans do gin and tonic’s right. The Gin House has a classy lounge vibe and serves up all kinds of different gin cocktails. They have over 200 varieties of gin, all seasoned with fruit, herbs and spices that pair well with the specific gin that you ordered. These added touches really up the flavor profile and create something much more enjoyable to drink than you average gin and tonic. Porto is about an hour drive to the Douro Valley, where several wines are made including its namesake, Port wine, a deliciously sweet desert wine. We booked a trip with Cooltour, which takes you on a shuttle out to Douro to taste at two wineries, and a boat ride down the Douro River. Since we went in November, as we drove into wine country beautiful orange and yellow colored vines covered the rolling mountains. When we arrived in Douro, we were greeted by a bubbly host who showed us the old process of creating olive oil with a press. Then we tried some nice wine from Velha Geração, with a view of the Douro River. We left for a boat ride down the Douro River and quickly made friends with everyone on our tour over a bottle of wine. Next stop was some Port tasting. We tried several ports with different color variations made from different types of grapes. Port is delicious, but when drank consecutively it’s gets to be a bit much with the sweetness for me personally. It’s meant to drink as one glass, at the end of a meal. We could’ve tried and spit them out, but let’s be real, I never waste wine. Also, that wouldn’t ruined out drunken ride home where our van decided to do a sing-along to different popular tracks. Our tour guide also happened to be an amazing “fado” singer. I’ve discovered that this not uncommon in Portugal. Fado is a very popular kind of singing in the country and we ran into it several times when we visited Lisbon. The uber driver, lots of restaurants, and now our wine tour guide. I love it! Porto is filled with really unique bars. We wandered down R. da Galeria de Paris and stopped at a bar that struck our attention for it’s ambiance. The lighting was dark with a warm glow, it had long mirrors, disco balls and a wall of bookshelves. The DJ was mixing digital beats with records by Nina Simone and B.B. King. The sound was amazing coming from the records, it felt like there was a live band and we danced the night away sipping on gin and tonics. Tip: Prepare yourself for late night dinners and dancing. The restaurants start filling up at about 10pm and the bars get going around midnight. 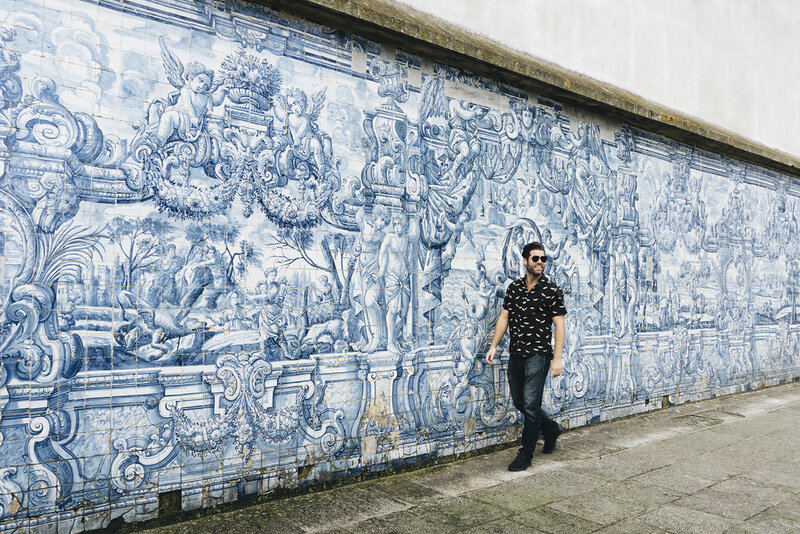 Portugal in general is a warm and welcoming place with great wine, gorgeous beaches, friendly people and tasty food! We took a day trip from Lisbon to Sintra, a UNESCO site with royal retreats, estates, and castles. 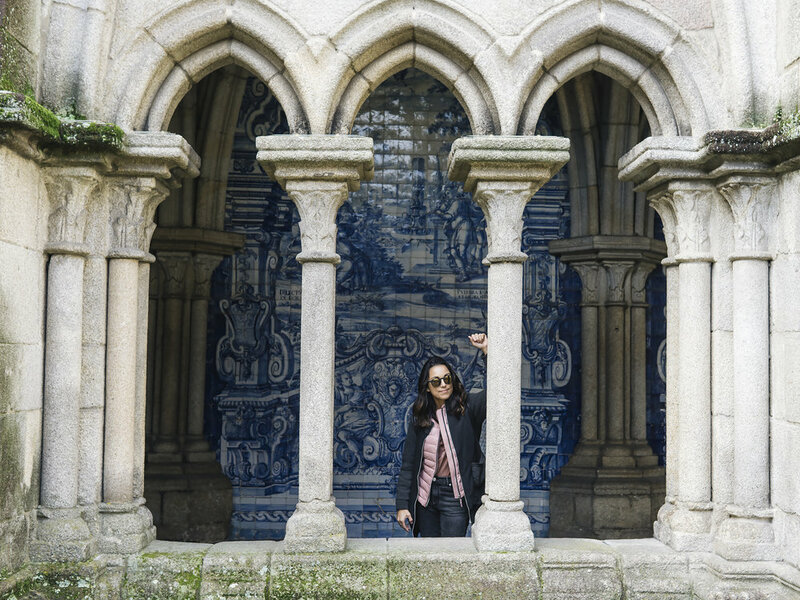 We rented a tiny car and took it to two major sites, Quinta da Regaleira and Pena National Palace. We wandered through the palace and grounds of Quinta da Regaleira, through hidden grottos, lookout points, and a large initiation well. After a week in Morocco, we dropped in on Lisbon. I'm amazed that I hadn't heard anyone rave about this city before—I fell in love with it pretty quickly.